Rosemary Knits: Spindles! Great Western Alpaca Show! Spinning Cotton! OhMy! Spindles! Great Western Alpaca Show! Spinning Cotton! OhMy! 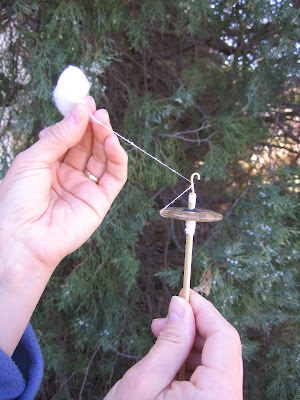 I've always heard that small spindles which spin very fast are good for spinning cotton, so I decided to give it a try. Here you see me spinning a cotton ball - just a regular old cotton ball out of a bag of cotton balls from my bathroom closet. I've lost my mind, it's assured. But, it was quite fun! Here are the ones I’ve made so far – there are a couple more in the works. I’m going to ask a rock-expert-friend to identify the stone ones – it’ll be fun to know the names of the stones. Three glass versions – how I love the milky one, on the upper right; it seems to glow. They look surreal from underneath, don’t they? Giant Spindles! Run for your life! These little spindles are so much fun! They spin like crazy – very fast! They are pretty, fairly well balanced and best of all, they're completely convertible. They can be top whorls, bottom whorls, middle whorls, whatever you like, as the "jewel" slides up or down the shaft, but once you move it, it stays where you put it. I can put a notch into the jewel, if you like, but I prefer them without a notch. I’ll also have loads of toy wheel spindles for sale. 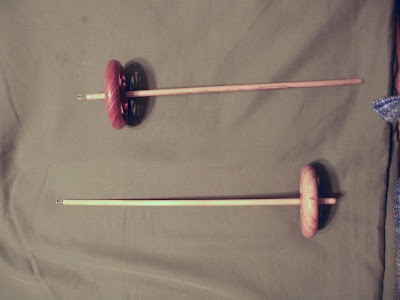 These are the workhorses in my stable of spindles. I’ll have top whorls (shown on top) and bottom whorls… …in three sizes – 2 inch, 2.5 inch and 3 inch diameter wheels, all notched, all with brass hooks. You'll love 'em. Also, you are most certainly invited to take a “test drive” so that we can be sure that the hook is adjusted exactly right for you. 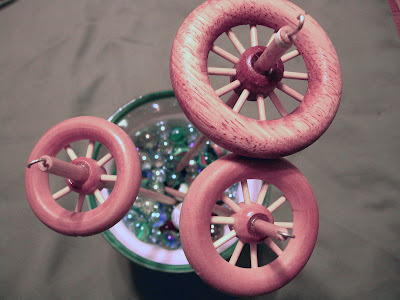 I just love these spindles – since the wheel has spokes, it puts the weight of the whorl at the outside - rim weighted - and the result is a nice, long, spin. They really work well. The smaller ones are nice and light, just right for lace weight spinning. 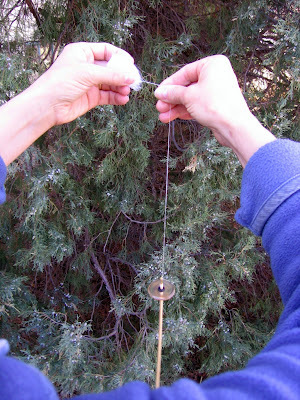 As a matter of fact, I’ll be teaching spindling all day long, just drop in. I’ve learned a new technique, and I’m thrilled to pieces. I’ve learned to Ply On the Fly – knowledge courtesy of a genius person, Tammy Rizzo. This is the smartest thing ever!!! You spin a length of yarn, ply it, wind it onto the spindle, spin another length, ply it, wind it onto the spindle, and so on. Do you get that? You spin AND ply, more or less at the same time. You spin AND ply, more or less at the same time. So, when you get to the end of your roving, you are all done. No plying step waiting for you. No trying to estimate how much over ply to insert in order to compensate for the fact that your spindle has been sitting there for a month, waiting for you to get back to it. None of that. I tell you, Tammy Rizzo is a pure genius, and this spinning technique is one to know. I’ll teach you. Allie's booth will also feature knitting lessons (Hmmm... I wonder who is going to teach those? *blush* That would be... ummm... me...), crochet lessons, needle felting, wet felting, and I don’t know what else. All of the lessons will be free to those who purchase the kits which Allie will have available in her booth. There is no advance sign-up required for the knitting or spinning lessons, just show up and you can get started. Consult the link, scroll to the lower half, for information about the other classes, as they have set times. This is what the knitting kits feature – Coffee Cuffs! These are small projects, each with a different technique to learn. The I-cord cuff (shown in brown – other colors available, too) is knitted with an I-cord cast on and I-cord cast off. You will learn how to graft the front end of the I-cord to its back end, which makes it seamless and beautiful and you will marvel at your knitting and grafting ability! The I-cord cast on and cast off are brilliant techniques with lots of other applications - once you know how, you’ll be I-cording everywhere; it's tremendously useful. The other Cuff is worked from the top down and it features a tubular cast on in the round – yes, in the round! There is no going back to sew up the cast on edge – when you are done, you are Done. This makes for a lovely edge, and what a great technique for cuff-down socks, mitten cuffs, sleeve cuffs, hats, and other applications. It’s fairly easy, once you get the idea. If you are interested in knitting lessons, then – Bring Your Needles, all of them! Both projects can be worked on dpns, if you like, or I can show you how to knit them on one circular needle – the Magic Loop – which some folks loathe, and others just LOVE. I’m one of those who love the technique, which is wonderful for socks, sleeves, hats – basically anything which is tubular. It also works for flat items such as doileys, shawls, and so forth. No more dpns for me! However, I completely understand the lure of dpns, and can teach the techniques with any tools that you like. For the very beginner student, the cuffs can be worked in garter stitch as a straight band which is later sewn into a tubular shape. This would be a good project for a young child who wants to learn to knit. I’ll have some chunky yarn available, so if this interests you, then please bring your larger needles! My teenaged daughter, Grace, will be there on Saturday, teaching knitting and crocheting. She’s developed a line of totally cute cases for cell phones, ipods, mp3 players, and sunglasses, in knit or crochet, and she’s working on a cute crochet scarf pattern. She’ll have some cases for sale, and will be teaching these classes on an on-going basis on Saturday afternoon. These are worked in “Punch,” a wonderful alpaca yarn in bright, fun colors. The techniques taught will include the Turkish cast on (wonderful for toe-up socks), the jogless jog, I-cord bindoff, picking up stitches in an already knitted item, and who knows what else Grace will come up with. Her classes are appropriate for everyone, but the projects are definitely aimed to the teenaged audience. First Weekend in May - National Western Complex. The animals are downstairs, and the Fiber Fiesta is upstairs. Join us! I'll be there, all weekend. I can't wait! Your spindles are very beautiful. I'd love to have one or two or the whole bunch but since I won't be in Denver (I live in Reno) I guess I'll have to pass this time. This plying on the fly, I MUST LEARN THIS. I went to her site but, heavy sigh, there nothing. Any way to teach the rest of us? So, is the plying on the fly Navajo plying? It sounds intriguing. What a wonderful blog. Your spindles are beautiful. Your stone spindles are lovely! It looks like they spin well too!